We’d love your help. Let us know what’s wrong with this preview of Mirrored Deception by Emma Leigh Reed. Jayla Ralston is running. After her apartment break in, she decided to get away from life and her overbearing twin sister. She finds the perfect Maine hide away to make some changes - The Cliffhouse Bed and Breakfast. It was perfect...until the phone calls resumed - kicking her paranoia into high gear. Trenton Montgomery is out for revenge. It has taken him ten years to re Jayla Ralston is running. After her apartment break in, she decided to get away from life and her overbearing twin sister. She finds the perfect Maine hide away to make some changes - The Cliffhouse Bed and Breakfast. It was perfect...until the phone calls resumed - kicking her paranoia into high gear. To ask other readers questions about Mirrored Deception, please sign up. Jayla Ralston's life seems to be crashing around her. The male roommate, whom she had just kicked out for his obsessive behavior toward her, has just returned while she was out and trashed her apartment, causing her overbearingly protective identical twin sister, Jenna, to demand Jayla seek protection. Instead, as soon as Jayla is alone, she packs a bag and her laptop, then jumps in her car and drives off, hoping to find peace. Hours later, she comes upon a large Victorian house on the Maine coa Jayla Ralston's life seems to be crashing around her. The male roommate, whom she had just kicked out for his obsessive behavior toward her, has just returned while she was out and trashed her apartment, causing her overbearingly protective identical twin sister, Jenna, to demand Jayla seek protection. Instead, as soon as Jayla is alone, she packs a bag and her laptop, then jumps in her car and drives off, hoping to find peace. Hours later, she comes upon a large Victorian house on the Maine coast that has been turned into a bed and breakfast and is being run by a handsome man named Tristan. As she settles in to hide out here for a few weeks, she develops a relationship with Tristan, but finds it strange that his character changes between meetings. What she does not know is that Tristan has an identical twin brother, Trenton, who Tristan believes died over ten years ago. Yet Trenton is now hiding out in a cabin on the property, waiting for his chance to seek vengeance on his brother for not seeking and saving him from his abductor, and Trenton is pretending to be Tristan when he meets Jayla in the backyard rose garden. This tale of a double set of dysfunctional twins crossing paths while dealing with fear, anger and secrets depends upon a creative sense of hyper-realism to get the reader to accept the circumstances of the plot. However, just as the foundation of suspense is laid for optimum effect, the author pulls back on the gas, missing the moment for a more exciting climax. In a separate comment on the e-book version I read, even though there was a minimal level of grammatical errors that could be easily corrected by a round of editing, the main distraction I ran across while reading this book was the overall formatting errors like the lack of hard page breaks between the chapters and the occasional appearance of the novel's title or author's name in italics within the actual body of the novel. This could be easily corrected and updated within the Kindle universe, so future readers might not encounter this in future versions. Won from a CoffeeTimeRomance Giveaway! After a break-in at her apartment leaves her shaken, Jayla Ralston is in desperate need of a change of scenery. Packing a bag, she hits the road. Spotting the charming and quaint Cliffhouse Bed and Breakfast, Jayla checks in for a little R & R. Slowly the stress from her overprotective sister and the paranoia caused by the break-in melt away, allowing Jayla to fully enjoy her stay at the beautiful inn... and her brief, yet completely sensuous encounters Won from a CoffeeTimeRomance Giveaway! After a break-in at her apartment leaves her shaken, Jayla Ralston is in desperate need of a change of scenery. Packing a bag, she hits the road. Spotting the charming and quaint Cliffhouse Bed and Breakfast, Jayla checks in for a little R & R. Slowly the stress from her overprotective sister and the paranoia caused by the break-in melt away, allowing Jayla to fully enjoy her stay at the beautiful inn... and her brief, yet completely sensuous encounters with the hot & cold inn owner. However, Jayla's respite is short-lived when she starts receiving strange phone calls that leaves her wary and afraid of everyone at the Cliffhouse. Unbeknownst to the guests, the inn has a few ghosts of it's own, and no one knows that better than Trenton Montgomery. After spending the last 10 painful years biding his time and carefully planning his revenge, Trent is back. More determined than ever, Trenton's plans will affect all in residence when he exposes the Cliffhouse's terrible past and the people who wronged him a decade earlier. 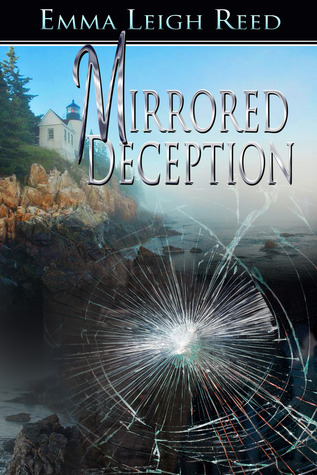 Filled with oodles of mystery, suspense and thrills, Mirrored Deception was a good read. Set against the beautiful Atlantic, the Cliffhouse B & B seems like a dream, while the characters (& the twin aspect) were charming, pleasant and tragic. The Parent Trap-esque encounters were both entertaining and frustrating, a good sign of a good story. Add in the right amount of romance to keep my interest, and MD was an enjoyable book I finished in one night. Two sets of twins…. Twist and turns....who is who...good starter for a mystery writer. The writing was simple, sometimes too simple. I can see where she was going with the story line but it didn’t take me where I wanted to go. Everything was over explained by each character….I didn’t buy into the revenge; it didn’t make sense for the main character to be so upset. For a younger crowd this would be a great book to read, but for a more seasoned reader, not so much. I will howe Goodreads Giveaway Book. I will however give this book to my teenaged daughter, and she can share with her friends to get the word out about this Author. Great book! I really loved Emma's writing style and her descriptiveness. I really felt like I was walking through the grounds of the bed and breakfast with Jayla. I would have given this book a 5, but I felt like the ending was rushed. I was really enjoying the book and so into what was going to happen next and felt like I was kind of left hanging. Still a great, fun, and quick read. I would recommend it. Thanks to good reads and the author for this First Reads giveaway! I managed to sympathize somewhat with the protagonist, but overall I thought the characters were poorly developed, especially Tristan. The writing was disappointing as well. It was full of cliches.